Originally published in 1948, at the height of post–World War II optimism and confidence in collective security, Ideas Have Consequences uses “words hard as cannonballs” to present an unsparing diagnosis of the ills of the modern age. Widely read and debated at the time of its first publication,the book is now seen asone of the foundational texts of the modern conservative movement. In its pages, Richard M. Weaver argues that the decline of Western civilization resulted from the rising acceptance of relativism over absolute reality. In spite of increased knowledge, this retreat from the realist intellectual tradition has weakened the Western capacity to reason, with catastrophic consequences for social order and individual rights. But Weaver also offers a realistic remedy. These difficulties are the product not of necessity, but of intelligent choice. 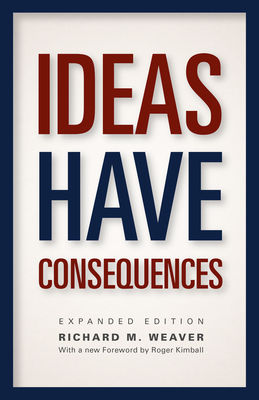 And, today, as decades ago, the remedy lies in the renewed acceptance of absolute reality and the recognition that ideas—like actions—have consequences. This expanded edition of the classic work contains a foreword by New Criterion editor Roger Kimball that offers insight into the rich intellectual and historical contexts of Weaver and his work and an afterword by Ted J. Smith III that relates the remarkable story of the book’s writing and publication. Richard M. Weaver (1910–63) was an American scholar, revered twentieth-century conservative, and professor of English and rhetoric at the University of Chicago. He is the author of several books, including The Ethics of Rhetoric and Visions of Order: The Cultural Crisis of Our Time.